elobeatlesforever: Recommended: Stand Up & Rock! Hello ... Hello ... my old friends ... It's great to see you once again! 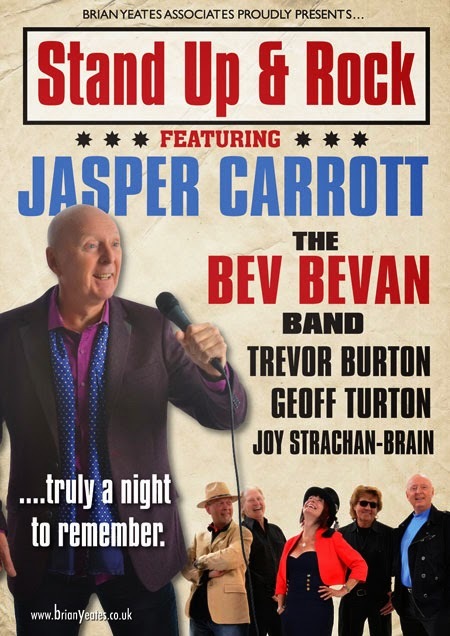 After the triumphant success of last year's Made In Brum tour and a few recent hints by Bev Bevan, Jasper Carrott and the gang have confirmed via promoter Brian Yeates that they are returning with a new forty five  date series of shows entitled Stand Up & Rock! during Autumn into Winter 2014. Bev and Jasper will again be joined by pals Trevor Burton [The Move], Geoff Turton [The Rockin' Berries] as well as the lovely Joy Strachan-Brain [Quill] and, of course, The Bev Bevan Band [featuring Tony Kelsey, Phil Tree and Abby Brant].